I’ve run into so many people lately–both in real life and online—who want to learn to tackle home canning. These easy canning recipes are a good place for beginners to start. Believe me when I tell you that home canning is really very easy. You just need to keep this one very important thing in mind: Low acid foods (think: meat and veggies) must be processed in a pressure canner. A water bath process—basically, immersing full jars in a deep pot of boiling water for a specified period of time—is great for plenty of other things. Suitable for high acid fruits, pickles, and many tomato recipes, it’s also one of the easiest canning methods. It’s served me well for years in preserving much of my garden abundance. These canning recipes are all safe for water bath canning. This is what you need to know about canning jars. This is what a water bath canner looks like. A day of canning might look like this. If you are me. Please always follow safe canning practices as outlined here. Trust me — it’s not hard. If you can follow directions, you can do this. Since pressure canning can often be seen as difficult, it makes sense to start with the simpler process of water bath canning. The recipes below can all be safely preserved using a water bath canning method. This method is easy. If you can chop and mix and cook food on the stove top, you will find it easy to take it to the next step, which simply requires putting food into jars and boiling them for a specified amount of time. You likely make garden fresh salsa all summer long, but you can fill your pantry with jars of salsa that will get you through the off-season. I use canned salsa to cap off taco night and as a homegrown ingredient for my chili. For something a bit different, try making a batch of this sweet and savory tomato chutney (one of my favorite canning recipes). Save those end-of-season green tomatoes to make chow chow. Yes, it’s a funny name, but it’s delicious and gives a tangy zip to sandwiches and is great for stirring into egg salad. One of my go-to canning recipes — I’ve been making this since I was a girl. I grew up on an apple farm, so you can bet that our collection of canning recipes included bushels and bushels of applesauce, always sugar-free and with extra cinnamon. If you’ve got an abundance of zucchini, let them take the lead in this sweet zucchini hamburger relish or turn them into bread & butter style pickles. 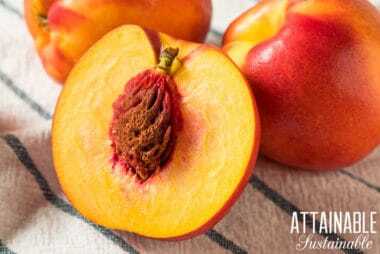 Preserve the flavor of summer with these chai spiced peaches. You’ll be so happy to have these flavorful fruits in your pantry this winter! They’re easy to can with a simple water bath process. Permission granted to republish this infographic; please link back to Attainable Sustainable and KathleenReilly.com. Yes! I love the infographic! I’ve Cannes using the water bath method three times and it still intimidates me. My husband and I are going to start canning in small batches, a la Food in Jars, and get more practice that way. Thanks for the great post! Your pictures are so inspiring! I canned for the first time this year. So far I have canned orange marmalade and pineapple jam. Strawberry jam is next, then hopefully my tomatoes will produce so much that I get tired of canning tomato sauce and salsa! I don’t think I can ever get tired of canning salsa. Great for chips, toppings, and I add it to my chili and Mexican dishes. Perfect way to preserve the garden bounty! Love your graphic but needs two tiny amendments. First, NEVER use a knife to release air bubbles unless it’s plastic. Metal knives, no matter how light weight, can fracture the glass of your jars without you knowing it. Second, you need to add to take jar ringsOFF before storing! It’s so important! 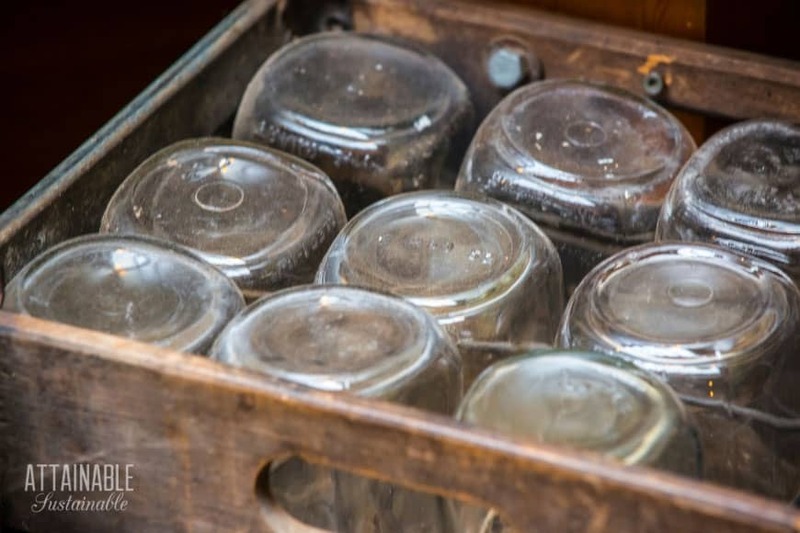 If your jar comes unsealed (which it can do even weeks or months after processing), a ring on the jar could cause it to re-seal and you are susceptible to eating foods that are no longer bacteria and botulism free. You can leave rings on it doesn’t hurt it. You should take the rings off and wipe them off and the rim to make sure nothing is on them. I store mine with rings on and they don’t reseal just because rings are on. Second you can use a butter knife I do all the time. It’s just better to use plastic or silicone. It’s recommended to remove the rings once jars have cooled. If a seal on a jar goes bad and the ring has been left on, it may cause the jar to reseal with temperature or humidity changes. If a seal goes bad on a jar with the ring removed, the lid will pop and stay popped. I agree, it is important to take the rings off after cooling. Among the reasons already mentioned, if you leave the rings on, they could rust, making it nearly impossible to remove the lid. Yes, a big problem here in humidity central! An infographic for canning with a Pressure Canner would be great.